An NFC bus shelter in a deserted London street. Do they seriously think that anyone will tap on this? Don’t get me wrong, I really like mobile NFC. Or at least, I like the idea of it. NFC can act as a fast, simple mobile wallet. It also has plenty of potential as a brand interaction channel. Touch in for ticketing, touch in to receive further brand information, touch in to join the in-store WiFi, touch in to leave your contact details. The possibilities are almost endless (there’s a good paper from the GSMA on the opportunities here). However, there’s a big problem with mobile NFC. Consumers, (and for that matter some retailers) just aren’t that bothered about it. What Do We Know About the Success of NFC So Far? 200 million handsets sounds good. But to put that in perspective, it’s less than 4% of all handsets (and the audio tagging app, Shazam has 300 million regular users). NFC has a long way to go before it is as ubiquitous as Bluetooth, which is in 80% of all handsets. And the stats don’t tell us how many people actually use NFC. Unfortunately there is no published information that states the number of people regularly using mobile NFC (I would guess at about 10% of those who have it on their phone, but if anyone has got better data, then please tell me). If the uptake of NFC was high, I would expect that the providers would be shouting about it. Square, another mobile payment system did $4bn in 2012. How does that compare to NFC? My estimate is that mobile NFC payments are much less than that (feel free to correct me if you have accurate figures). Whilst there are plenty of predictions of exponential growth in NFC, there’s little evidence that it is actually happening. At best, we will see an incremental growth in users, rather than the exponential growth that some have predicted. So why is NFC failing to take off? For starters there’s the retailers. Only a minority of them take contactless, and when they do, it’s not made obvious to the customer. The other day I was in a certain sandwich shop, and wanted to pay by contactless. First, I had to find the machine. It was buried under some packets of crisps. Then I had to ask the till assistant to turn it on. Except that they’d already got the chip and pin machine ready to hand to me. It is exactly this kind of experience that make’s consumer wonder, ‘what’s the point’? NFC ought to be a highly usable and frictionless experience, yet in practice, it rarely is. It now seems that some retail giants are far from convinced of the benefits of NFC (see below). Some people blame the lack of NFC in the iPhone as the reason it has yet to go anywhere in mobile. It’s certainly true that Apple users have driven a lot of mobile usage in the past. However, not only are there now considerably more Android phones than Apple’s offering, but usage of apps and web is similar to those of the iPhone. Arguably, Android is just as likely to drive usage as iOS. It now seems unlikely that Apple will ever implement NFC, with their focus on developing their own wallet rather than a retail payment mechanism. What about mobile NFC outside of payments? 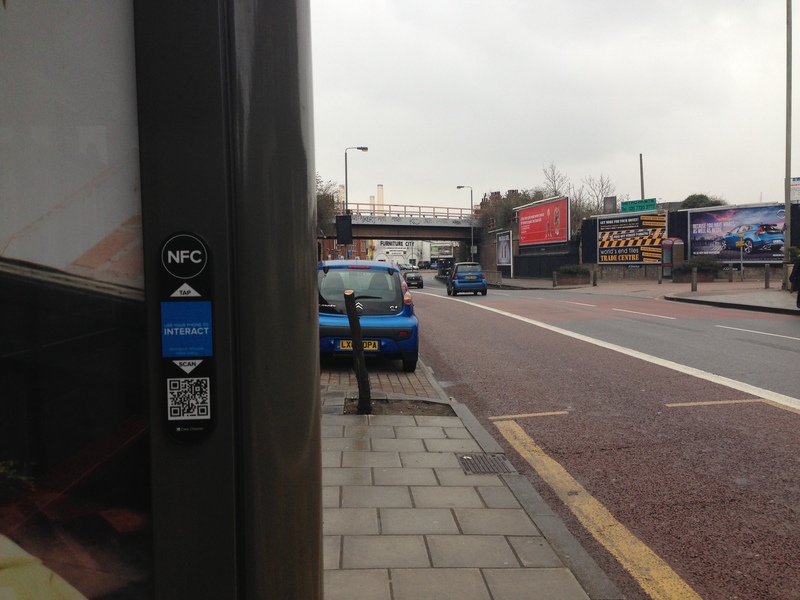 In the UK a number of the outdoor ad companies are sticking NFC points all over the place, especially at bus stops. That’s quite a strange thing to do. Ask any OOH warrior and they’ll tell you that most bus stop advertising is aimed at the people going past in their cars, not the people waiting at the stop. The point is that brands are failing to show examples of useful, engaging NFC experiences that will demonstrate the benefits to consumers. NFC doesn’t really solve any pain for consumers. Arguably if it was going to be adopted widely, then it would have happened by now. A representative from the supermarket, Tescos recently stated that NFC is too complex and offers too few benefits for it to go anywhere. A key point was that consumers are now looking for a payment experience entirely within their mobile device. Think of the Starbucks loyalty app or Pizza Express’ mobile payment system. And from a brand perspective that also makes a lot of sense. Building payment into an app is a good bit of behavioural economics, which takes away the ‘pain of payment’. Think how Amazon One Click or iTunes do it. Some supermarkets, such as Sainsbury’s are already experimenting with apps which allow consumers to scan and purchase in-store all through their mobile. My view is a UK/Euro-centric one. NFC has the opportunity to bring simple payment systems in emerging countries. A number of commentators have pointed to the success of contactless systems in Asia (still no data to demonstrate it, though). However, it’s dangerous to assume that what happens in some Asian countries can be applied elsewhere. In Europe, at least, there doesn’t seem to be much good news for mobile contactless. Much as I like NFC, it seems as if consumers really don’t care about it, and the opportunity for the channel may now have passed.